Consumers are being encouraged to coin new words and use wordplay to redefine existing ones to represent the emotional states of men, the best of which will appear in a published #Mandictionary for male suicide charity CALM (Campaign Against Living Miserably). 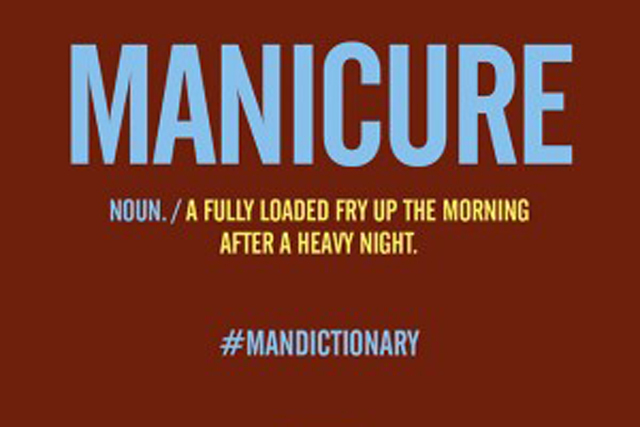 CALM and its agency Theobald Fox are encouraging people to tweet their suggestions using the hashtag #Mandictionary. Suggestions so far include "emancipation", "manicles" and "Mandela". The campaign has been devised to raise awareness of male suicide - 12 men commit suicide every day in the UK - and broach the subject of male depression in a manner that breaks through stigma with humour and positivity. Winning submissions will be used in ads, as well as the #Mandictionary itself; although it has yet to be decided what form the finished tome will take. The campaign is being promoted on Twitter, Facebook and Instagram, while posters sites will also carry the ad. CALM’s website is carrying a gallery featuring an array of people’s suggestions. Primark's 'cry for help' messages: genuine or PR stunts?